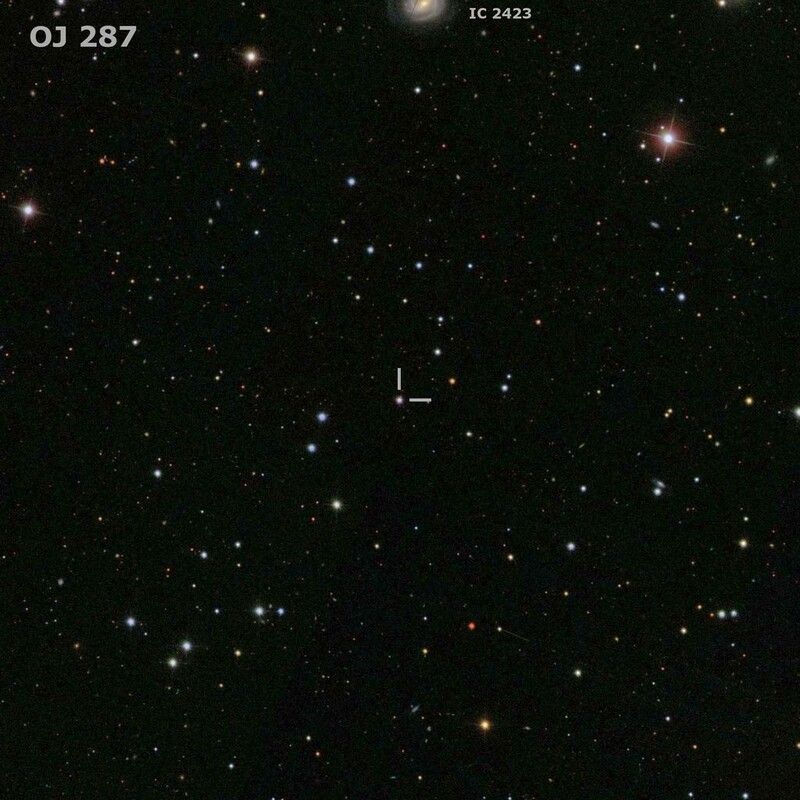 OJ 287 is a violently variable BL Lac object in Cancer and is also one of the best-studied objects of its kind. This BL Lac object displays extremely large and rapid flux variations at both radio and optical wavelengths with variability time-scales varying from minutes to years - a typical OVV. OJ 287 is very active with a total optical variability of more than 5 mag, showing large optical outbursts. Together with its high degree of polarization, this object was classified as a BL Lac object. The designation OJ 287 derives from the radio survey of the Ohio State University (OJ), where this object was cataloged as a radio source. Initially, the radio source was discovered in the mid 1960s by both the Vermillion River Observatory radio survey (VRO) at 610.5 MHz and the Ohio radio survey (OJ) at 1415 MHz. The most interesting feature of OJ 287 is its optical behaviour. Light curves of former monitoring programs revealed outbursts with a period of approximately 12 years in the optical and in the infrared. Each outburst is described by a twin-peak structure. This unusual periodicity is explained by the model of a precessing binary black hole, consisting of two supermassive black holes with 18×109 solar masses for the primary and 1.5×108 solar masses for the secondary black hole. According to the model, the secondary black hole is moving around the primary on a highly eccentric orbit, perturbing the accretion disk of the primary during pericenter passages, once every 12 year orbital cycle. International multi-wavelength monitoring programs during the predicted outbursts in 1993/94 (OJ-94 project) and 2005/07 confirmed this model. The author participated in the 2005/07 Pro-Am observing campaign. The latest predicted outburst of OJ 287 occured in November–December 2015, coinciding with the centenary of General Relativity. In the case of OJ287, the tremendous gravitational field of the larger black hole causes the smaller black hole’s orbit to precess at an incredible 39° each orbit, as predicted by Einstein’s theory of general relativity. "Its (OJ 287) light curve is definitely not periodic but the deviations from periodicity are systematic and predictable in a model that contains a gravitational wave driven inspiralling spinning binary black hole system as its central engine" (Valtonen et al. 2016). Due to the loss of orbital energy by gravitational radiation the two black holes will merge within the next 10,000 years. For both visual and CCD observers, OJ 287 is an interesting target at any time. During brighter state, visual observers with telescopes of 8- to 10-inch of aperture and larger will have no difficulties to spot this blazar. Visually, OJ 287 remains a stellar object even with large apertures. CCD observers as well as visual observers may use the comparison stars given above. Other photometric sequences were published by Penston et al. (1973), Craine et al. (1975), Veron et al. (1975), McGimsey et al. (1976), Smith et al. (1985), and the BAAVSS - which underlines the high astrophysical interest regarding this very special AGN. quasar PG 0844+349, a bright 14-mag object at a distance of about 0.8×109 light-years, located some 14° N of OJ 287. Another violently variable BL Lac object is PKS 0754+100, which lies some 17.3° SW of OJ 287, at a distance of about 3×109 light-years. 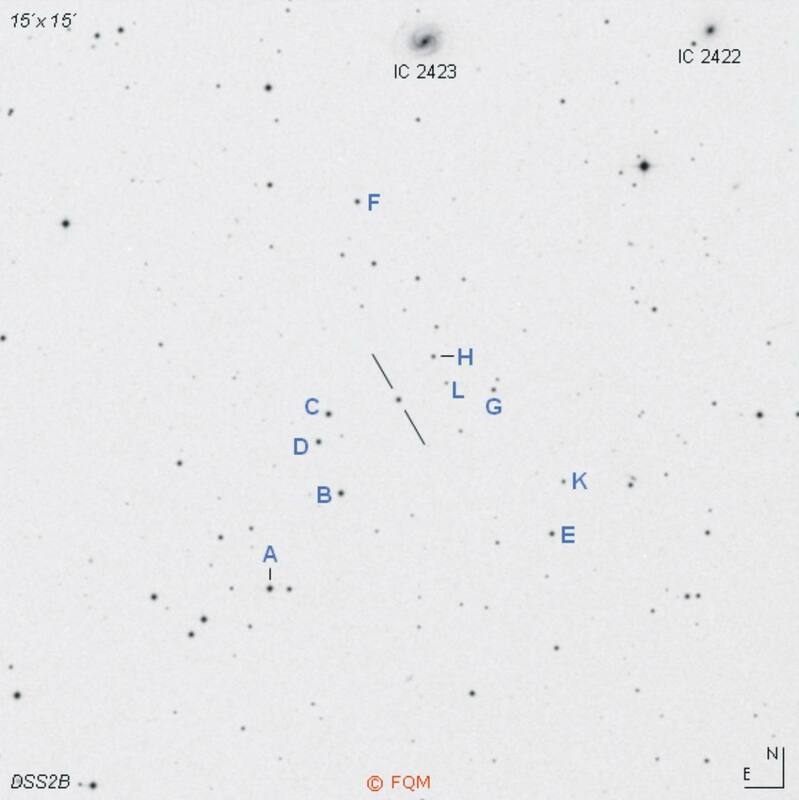 When you are around for OJ 287, do not forget to visit open cluster M44, the "beehive cluster", about 3° E of OJ 287. Some 1.6° to the SW you find the interacting galaxy pair NGC 2672/73 (Arp 167). Variable star observers may like to take a look at carbon star T Cnc (7.6-10.5 mag), only 30´SE of OJ 287. Its vivid reddish colour is a nice catch for medium sized telescopes. Blake, G.M. 1970, ApL, 6, 201; Observations of Extragalactic Radio Sources having unusual Spectra. PKS 2141+17, OJ 287 and ZE 0039.5+04. Craine, R.E. ; A Handbook of Quasistellar and BL Lacertae Objects; Parchart Publishing House, Tuscon 1977. Dickel, J.R., Yang, K.S., McVittie, G.C., Swenson, G.W., Jr. 1967, AJ 72, 757; A survey of the sky at 610.5 MHz. II. The region between declinations +15 and +22 degrees. Fiorucci, M., Tosti, G. 1996, A&AS, 116, 403; VRI Photometry of Stars in the Fields of 12 BL Lacertae Objects. Gaida, G., Röser, H.J. 1982, A&A, 105, 362; The Photometric History of the BL Lacertae Object OJ 287.
stars: An All-Sky Network of faint Stars calibrated on the Landolt System. Haikala, L. 1983, SuW 3/83, 111; OJ 287: Ein periodisch veränderliches BL-Lac-Objekt. Hansen, T. 1991, Deep Sky Magazine 34, 32; The "Deepest" Deep Sky Objects. Harrington, P. 1994, Astronomy 6/94, 56; Tracking down a Quasar. Karge, S. 2002, Interstellarum 22, 8; Der extragalaktische Variable OJ 287. Kasper, M. 1997; SuW 12/97, 1029; Schwarzes Doppelloch. Kinman, T.D. 1976, ApJ, 205, 1; Photoelectric Magnitudes and Polarization Data for possible BL Lacertae Objects. Lehto, H.J., Valtonen, M.J. 1996, ApJ, 460, 207; OJ 287 Outburst Structure and a Binary Black Hole Model. Lloyd, C. 1984, MNRAS, 209, 697; Optical Monitoring of Radio Sources. Miller, J.S., French, H.B., Hawley, S.A. 1978, in: Pittsburgh Conference on BL Lac Objects, A.M. Wolfe (ed. ), p.175. Owen, F.N., Porcas, R.W., et al. 1978, AJ, 83, 685; Observations of Radio Sources with Flat Spectra. Puschell, J.J., Stein, W.A. 1980, ApJ, 237, 331; Observations of strongly polarized Extragalactic Sources. Sillanpää, A., Haarala, S., et al. 1988, A&AS, 72, 347; Optical Monitoring of Quasars and BL Lac Objects. Sillanpää, A., Haarala, S., et al. 1988, ApJ, 325, 628; OJ 287: Binary Pair of Supermassiv Black Holes. Sillanpää, A., Mikkola, S., et al. 1991, A&AS, 88, 225 ; Optical Monitoring of Quasars and BL Lacertae Objects. II. Stull, M.A. 1973, Sky & Telescope, Vol. 45, 4/73, 224; Two Puzzling Objects: OJ 287 and BL Lacertae. Ulrich, M.-H., Maraschi, L., et al. 1997, Ann. Rev. Astr. Ap., 35, 445; Variability of Active Galactic Nuclei. 2005 Outburst in OJ287 and the Precessing Binary Black Hole Model. Valtonen, M.J., Ciprini, S., Lehto, H.J. 2012, MNRAS 427, 77; On the masses of OJ287 black holes. Véron, P., Véron, M.P. 1975, A&A, 39, 281; Photographic Photometry of Five BL Lacertae-type Objects. Véron-Cetty, M.-P., Véron, P. 1998, ESO Scientific Report 18; A Catalogue of Quasars and Active Nuclei (8th Edition). Véron-Cetty, M.-P., Véron, P. 2000, ESO Scientific Report 19; A Catalogue of Quasars and Active Nuclei (9th Edition). Wenzel, K. 1997, Interstellarum 10, 25; Quasare - Objekte für den visuell beobachtenden Amateur. Wenzel, K. 2002, Interstellarum 20, 56; OJ 287 - ein schwarzes Doppelloch. Wenzel, K., Düskau, W. 2003, SuW 2/03, 60; BL-Lacertae-Objekte - Eine Herausforderung für den Amateur. Xie, G.Z., Li, K.H., et al. 1990, A&A, 229, 329; Search for short Variability Time-scales of BL Lacertae Objects.